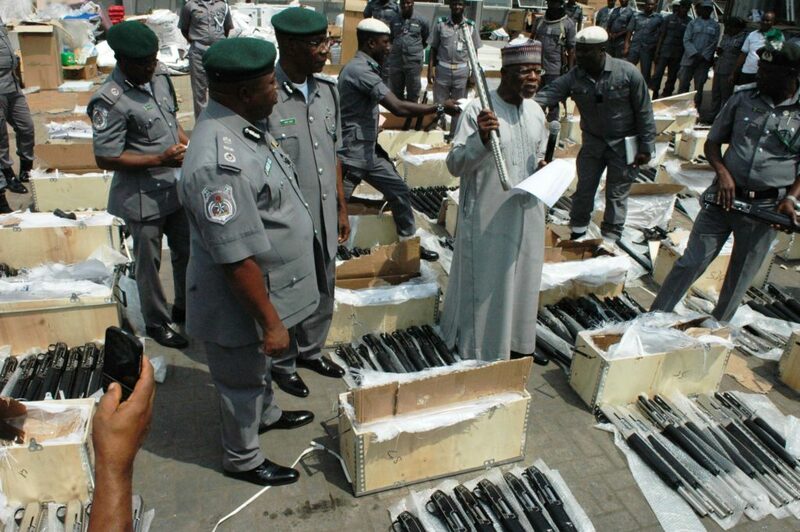 The Nigeria Customs Services (NCS) has arraigned a businessman Ifeuwa Moses Christ before a Federal High Court, Lagos, presided over by Justice Saliu Saidu for allegedly importing 1,570 pump action rifles into the country without lawful authority. Ifeuwa, a resident of 1, Ifeuwa Street, Ogidi, Anambra State, was arraigned before the court by men of the NCS alongside one Ayogu Great James, of Plot 291, Dawaki Extention, opposite Gwarinpa Estate, Abuja, and Emeka Umeh Festus, also known as Amankwa, now at large. They were charged for conspiracy, illegal importation of firearms, forgery and altering of Customs’ import documents. The offences, according the prosecutor, Julius Ajakaiye, a Deputy Director in the Federal Ministry of Justice, are punishable under Sections 3(6), 1(14)(a), 1(14)(a)(i), 1(2)(c) of the Miscellaneous Offences Act Cap. M17, Laws of the Federation of Nigeria, 2004. Ajakaiye told the court that the accused and others listed in a charge numbered FHC/L/339c/18, conspired among themselves between September 6 and September 20, 2017, to illegally and unlawfully import 1, 570 pump action rifles into Nigeria, through Apapa Seaport, Lagos. The prosecutor said that the accused loaded the rifles in two 1× 20 feet containers marked GESU 2555208 and CMAU 1878178. Ajakaiye stated that the accused and others now at large, in a bid to illegally and unlawfully bring in the weapons, altered and forged a bill of lading, issued in July 28, 2017, to read Guandong, China, instead of Istanbul, Turkey, which was written on the conveying container. The prosecutor also told the court that the accused also altered Form M (application for Import) and Pre-Arrival Assessment Report (PAAR), issued in August 28, 2017, with number MF 20170080364 and CN 20170768490/001 respectively, to read Guandong, China instead of Istanbul, Turkey, as country of origin. The accused were also allegedly altered a forged bill of lading numbered ISB0281398, issued in July 28, 2017, to read 230 packages of wash-hand basin and W/C, as the content in the containers used in shipping in the illegal firearms. After the pleas of the accused were taken, Ajakaiye urged the court to remand them in prison custody pending the determination of the charge. Though, lawyer to the accused, Mr. C. J. Jakponna, despite not filing any processes before the court, urged the court to grant his clients bail on liberal terms. Justice Saliu Saidu turned down the request and adjourned the matter till November 20 and 21 for commencement of trial and ordered that the accused be remanded in prison custody.